President Mwai Kibaki and Prime Minister Raila Odinga on Sunday led the country in marking the second anniversary since the National accord was signed. While attending mass at the Holy Family Basilica, the two principles dwelt on the need for Kenyans to be united while embracing their diversity. President Kibaki expressed optimism that Kenya would grow to be a prosperous nation. “We need to get together, not to get wasted in temporary quarrels. What I am pleading with every Kenyan is not to be selfish, don’t just think of a Kenya that is wonderful for you but everybody else is miserable, we want a Kenya that is prosperous for all of us,” he said. The Premier on his part defended the grand coalition government record and said a lot had been achieved in terms of uniting Kenyans, plus reforms were in progress. “Kenyans must be united as a people then we will be able to realise the Kenyan dream - to rid this country off ignorance, poverty, disease and bad governance which was the wish and will of our founding fathers,” the Prime Minister said. The two coalition partners steered off the constitution debate and said they wanted the will of Kenyans to prevail. While President Kibaki called on Parliamentarians to pass a constitution that was acceptable to all Kenyans, Prime Minister Odinga said this was not the time to engage in grand standing on the constitution issue. “And we don’t want to talk about it before they (Parliamentarians) have finished passing it but we will talk about it at parliament and other places and I am sure that is your wish that we all succeed and we shall have a good constitution,” the Head of State said. On Saturday however, President Kibaki made it clear that he would not accept a constitution that legalised abortion and said it must recognise that life begins at conception. Catholic Archbishop John Cardinal Njue who led the mass also emphasised on the abortion clause and said if the Members of Parliament amended it to legalise abortion then they would be “murderers”. “I would want us all - the politicians, clergy, civil society to be very cautious at this moment in time that we do not divide people,” he added. The government declared a National Thanksgiving and Cohesion day on Sunday, urging Kenyans of all religious backgrounds to pray for unity in the country. Today marks the 2nd anniversary since the accord was signed, to signal an end to the bloodbath witnessed in Kenya after the disputed presidential elections. The Orange Democratic Movement (ODM) on Sunday affirmed its support for the proposed draft constitution that is set to be debated in parliament. ODM’s endorsement of the draft comes at a time a number of party members have tried to reintroduce debate on some of the issues that were agreed on at an MPs retreat in Naivasha. ODM Secretary General Prof Anyang’ Nyong’o said that while some issues are yet to be resolved the party felt it was important to get a new constitution and resolve contentious issues later. One such issue has been the proposed devolved system of governance. “Of course, there may be genuine concerns on the part of the party regarding devolution and levels of government but we are willing to support the draft,” Prof Nyong’o said. The ODM Minister stressed the party’s commitment towards achieving a new constitution, adding the party was in it for the long haul. He argued that the proposed constitution was much better than the current one, which many Kenyans have been asking for. Prof Nyong’o urged Kenyans to vote in the new constitution and called on other politicians to desist from engaging in political battles that may scuttle the process. “This is not the time for recrimination. Nor is it the time for anyone to oppose the proposed Constitution due to some concerns. Kenyans are better off with this greatly improved draft than with the current constitutional dispensation,” he said. Prof Nyong’o lauded the Committee of Experts for completing the draft on time and incorporating public opinion in the crucial proposed law. ODM’s position on the constitution came as the country marked the second anniversary of the signing of the National Accord that bore the grand coalition government, where the two principals President Mwai Kibaki and Prime Minister Raila Odinga steered clear of talk on the constitution. Prime Minister Raila Odinga was received in Central Province on Saturday with placards declaring him a national hero. The scenes that greeted Mr Odinga as his motorcade made its way to Kigumo constituency in Murang’a were a sharp contrast to the hostility that marked his campaigns in Central Province in the run up to the 2007 General Election. Crowds lined the roadsides and trading centres waving Mr Odinga’s portraits, some titled “Njamba ya Bururi (National Hero)”. Security was tight with truckloads of General Service Unit personnel patrolling the area. The GSU were deployed to the area on Friday. The PM’s convoy made eight stopovers between Thika town and Kangari Primary School grounds, where he addressed the final rally. At every stop, the PM spoke on the need for national unity. At Kigumo Trading Centre shops were closed and people perched on the rooftops to catch a glimpse of the Prime Minister, who was accompanied by nine ODM ministers, several assistant ministers and MPs. Kigumo MP Jamleck Kamau did not attend the function as he is in Australia on official duty with members of the Parliamentary Service Commission. Maragua’s Elias Mbau, one of the MPs from the area who welcomed Mr Odinga, criticised Mr Kamau for skipping the event. Mr Kamau came under heavy criticism from the leaders led by Mr Mbau, Kiambu’s Stanley Githunguri and Mr Kamau’s predecessor Kihara Mwangi for skipping the rally. Mr Mbau said “a man does not run away and leave his wife to another man”. “Let us embrace everyone, their tribal background notwithstanding”. 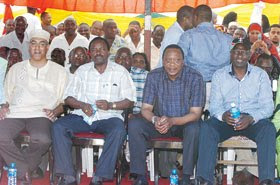 Mr Odinga said the country lagged behind in development because leaders were using the tribal card to divide Kenyans. He noted that at independence, Kenya’s economy was growing at the same rate as South Korea’s, but divisive politics had reduced the country to a pauper. The PM said the country still had the potential to join the league of the fast developing Asian economies such as China, Malaysia and Singapore. “We must stand up and say a big No to tribalism,” he said. Kenya, he noted, was being compared with its neighbours Sudan, Ethiopia, Somalia and Rwanda in terms of development and national cohesion because of tribal divisions. “When Jaramogi declared ‘Uhuru na Kenyatta’ and when in 2002 I said ‘Kibaki Tosha’, I knew they were Kikuyus but my desire was to see that all tribes were united,” he said. He said while freedom fighters, including those of the Second Liberation such as Charles Rubia and Kenneth Matiba – whom he visited on Friday afternoon at his Riara Ridge home – had fought for a united Kenya, it was regrettable that current leaders were dividing Kenyans along tribal lines for their selfish interests. A powerful lobby within the government has hatched an elaborate plan aimed at pushing the African Union (AU) to end chief mediator Kofi Annan’s mandate in Kenya, according to well-placed sources. The carefully calculated plan involves top government officials and Foreign Affairs people who want the AU to stop Mr Annan’s involvement in the country’s reform agenda, citing “undue intrusion”. One of the options being explored by the architects of the plot is to push the AU to censure the former United Nations secretary-general for allegedly overstepping his mandate while overseeing Kenya’s reform process. A senior official at the Foreign Affairs ministry, who cannot be quoted discussing confidential matters, confirmed that the government was determined to push Mr Annan out of the Kenyan process. “We are going to push for an end to his engagement in Kenya because we feel he is taking it too far. He is almost micro-managing Kenya, and people like Raila (Odinga) think he is our headmaster. We can handle our own problems,” the official said. But Foreign Affairs minister Moses Wetang’ula adopted a diplomatic approach to the issue when contacted. “As far as the government is concerned, (Mr) Annan was sent here by the African Union, alongside President Mkapa and Graca Machel by the then AU chairman John Kufuor. He added that it was only the AU which could end Mr Annan’s mandate. “I’m in constant communication with the African Union and, as far as I know, they are yet to communicate to us any intention of disengaging Mr Annan because they are the only ones who can do so. When they do, I’m sure they will communicate the decision to us,” he said. Mr Wetang’ula welcomed President Kibaki’s opening of the fourth session of the Tenth Parliament on February 23 when he urged Kenyans to resolve their own problems instead of turning to “outsiders” for help. This was a thinly veiled reference to recent calls by Prime Minister Raila Odinga for Mr Annan’s urgent intervention to resolve the dispute between the coalition partners. But ODM’s second in command, Deputy Prime Minister Musalia Mudavadi, warned that Kenya risked international isolation if it dares push for Mr Annan’s disengagement. “We should not even contemplate it. We risk burning bridges with our international friends because of that single move. Our friendship with the international community should not be one of convenience. When we were in a crisis, they came to our rescue, so we should not start rubbishing them simply because we now have relative tranquillity,” Mr Mudavadi warned. As a first move towards achieving their goal, the anti-Annan group pushed for Kenya to join the AU Peace and Security Council during the recent AU summit in Addis Ababa. It is from this position that they intend to lobby for Mr Annan’s censure, a move they hope will culminate in the termination of his mandate. The new countries elected for three-year terms to the crucial AU organ include Kenya, Equatorial Guinea, Libya, Zimbabwe and Nigeria. Countries elected for two years include Burundi, Chad, Djibouti, Rwanda, Mauritania, Namibia, South Africa, Benin, Cote d’Ivoire and Mali. The outgoing AU Peace and Security Council played a major role in ending the bloodbath that rocked Kenya in the aftermath of the 2007 General Election and which saw Mr Kufuor summon Mr Annan and his team of eminent personalities to mediate between President Kibaki and Mr Odinga. But there are those within government who feel that the new AU Peace and Security Council ought to remain focused on the Kenyan situation and that the mediation panel led by Mr Annan should remain in place since there is still some distance to be covered to full implementation of the mediation agreement and entrenchment of the reforms. Part of Mr Annan’s mandate is to ensure that the reform process initiated under Agenda 4 of the National Accord is fully implemented. The Agenda 4 reforms include establishing a Truth, Justice and Reconciliation Commission (TJRC), electoral reforms and the successful prosecution of those who planned and carried out the post-election violence that left more than 1,300 people dead and thousands displaced. Those pushing for the termination of Mr Annan’s mandate argue that Kenya has stabilised and no longer needs Mr Annan’s involvement. The Party of National Unity (PNU) on Saturday agreed to form an umbrella movement christened Progressive Democratic Movement (PDM) with the slogan ‘Tai’. PNU Executive Director Jasper Nyamboga said that the 108 MPs attending a party retreat in Naivasha also resolved that all PNU affiliate parties will join the movement and have a common interest in all issues. “We have agreed to work together and signed a charter to belong together inside and outside Parliament under the umbrella movement of PDM,” he said. He further said PDM will also support one candidate in the expected by-elections in Matuga and South Mugirango constituencies. “We agreed that any party is allowed to put their candidate in the nomination process. The one who will be the winner will be supported by all the affiliate parties in the movement,” he said. He said PDU was open to other individual MPs who wished to join the movement and were not affiliate members of PNU explaining that membership will be on individual and corporate basis. This could be an indicator that disgruntled Orange Democratic Movement (ODM) MPs can join the movement without ditching their mother parties. However, if one to joins a separate party, they must seek re-election. But he stressed that PDM was not a political party but a union to enable the parties work together. He said PDM will focus on constitutional reform, place diversity reaching out to grass roots spreading realms of change, ensure fast reforms and anchor reconciliation. “PDM will give a new volume to the political songs for katiba it’s a coalition of issues hitting the road to get the elusive goals basic campaign anti corruption crusade and new leadership,” he said. Mwai Kibaki has assured Kenyans and religious organisations in the country that the new Constitution shall not contain sections that contradict biblical teachings and long-held social values. President Kibaki made the assurance on Saturday at the Nakuru Showground during the installation and ordination of Father Maurice Muhatia Makumba as the new Bishop of the Catholic Diocese of Nakuru. He expressed confidence that the country was about to attain a new constitutional dispensation which would lay a firm foundation for a prosperous, stable and democratic country while also assuring of his personal commitment towards the passage and enactment of a new constitution. The President declared that he had faith in the current Parliament to protect important values that hold the Kenyan society glued together and in tandem with God’s teachings during the enactment of the new constitution. Earlier while enthroning the new Bishop, the Archbishop of Nairobi John Cardinal Njue stated categorically that the envisaged Constitution must not contradict the laws of God and must uphold the sanctity of life. Noting that he supported the stand espoused by the Cardinal and the church in general President Kibaki noted that the country must seize the existing opportunity to enact a new constitution after many elusive years. He further asked Christians to pray for the country and its leadership to enable them steer the nation to high heights of development and desist from pursuing negative and divisive agendas. During the occasion, President Kibaki assured that the government appreciates the role of religious organizations in promoting national development and social harmony. He reaffirmed that the role played by the Church as the custodian of moral integrity complements Government’s efforts to eradicate social vices. The President noted that the war against vices such as crime and corruption could not be won by the Government alone adding that other stakeholders such as the church, civil society and the media must play their distinctive roles in building a virtuous society founded on truthful religious values and the rule of law. The Head of State reaffirmed that the Government values the views of religious leaders and at all times remained committed to holding frank consultations aimed at serving Kenyan citizens better. He commended the church for its unwavering commitment to the promotion of moral values and urged other institutions to emulate the example set by religious bodies, of encouraging ethical behaviour among the youth. With regard to national unity the President urged the church to promote social harmony through preaching the Christian doctrine of reconciliation and forgiveness. President Kibaki congratulated the installed Bishop and prayed for God’s blessings and mercies upon his life as he embarked on the selfless task of serving both God and mankind. Leading the ceremony attended by Catholic Bishops and worshippers from all parts of the country, John Cardinal Njue termed Bishop Muhatia an envoy of God who must at all times be ready to fulfill the will of God by going wherever and doing whatever he is ordered to. Cardinal Njue urged the new Bishop to embrace reconciliation as the message of evangelisation in the region that acted as an epi-centre of the post election conflict and strive to break all barriers of peaceful co-existence among local communities. The Cardinal urged all Christians in the country to pray without ceasing for national unity and the laying of a firm foundation for current and future generations. He further asked the new Bishop to be a good shepherd of God’s flock and at all times strive to love and protect the weakest in the society without fear, because the favour of God is upon him. The Cardinal also urged the Nakuru Catholic faithful to pray and support their new Bishop irrespective of his cultural background, and position themselves to receive God’s blessing as a united family. He advised the youth in the country, whom he said are the majority population in the country, to refuse being used as instruments of violence for selfish leaders and to at all times shun political exploitation. Former President Daniel arap Moi urged Christians allow the gospel of Christ to dwell in their hearts and strive to be the salt of the world by promoting peace in their neighbourhoods. Other who addressed the ceremony included the Minister for Agriculture William Ruto, Youth Affairs Prof Helen Sambili, and the area MP Lee Kinyanjui. In attendance were assistant minister Charles Keter, several legislators drawn from various parts of the country and other senior government officials. Raila Odinga on Friday met former opposition leader and one time political detainee Kenneth Matiba ahead of his controversial visit to Murang’a on Saturday. The PM, accompanied by his wife Ida and Medical Services Minister Anyang Nyong’o visited Mr Matiba at his Riara Ridge home in Rironi, Limuru, where they discussed past and current events and Raila’s visit to Murang’a on Saturday. During the late afternoon discussions, Matiba, flanked by his wife Edith, was in high spirits and exuded confidence that he is on the path to full recovery. The two reminisced about their life as political detainees and agreed to meet former Minister Charles Rubia. Matiba said Rubia visits him often. He welcomed the PM to Murang’a and asked him to pay attention to the state of roads in the region. Without betraying any signs of bitterness and with anecdotes from his personal life, Matiba talked repeatedly of "the history of injustices in Kenya." "Some of the things that have happened in Kenya are very, very sad. Sometimes I count myself lucky," said Matiba. He also talked about the many missed opportunities that would have put the nation ahead. He lamented that there are "too many things that have never been made known." Responding to Matiba, Raila said he would be accompanied by the ministers for Roads, Medical Services, Cooperatives and Water to address the issues the locals want him to tackle. The PM said he was not a stranger in Murang’a, recalling that Matiba once took him on a tour of the entire district and later visited Matiba’s ancestral home. The PM said he in turn took Matiba to a four-day tour of Nyanza. The two talked about their life in detention at the Kamiti Maximum Security Prison with Matiba saying in those days, even medical doctors were part of the Government’s terror network. "Medics were part and parcel of the torture system," he said. Raila recalled that one doctor who had prescribed for him drugs for high blood pressure which he did not need while he was in detention at Manyani, was the same one who followed him and Matiba to Kamiti and insisted that the former Ford Asili leader was well when he was ill.
"All that is in the past and the challenge is for us to continue the struggle that we began and drive it to conclusion," Raila said. The Prime Minister will visit Kigumo on Saturday and tour various parts of the former greater Muranga District. Raila will initiate and inaugurate a number of Government and self-sponsored projects. The projects were selected and presented to him by civic and community leaders from the region in a memorandum presented three weeks ago. On Thursday, the PM held consultations with four MPs from the greater Muranga District over the trip. The meeting at Treasury reviewed the programme and finer details of the PM’s visit. Three weeks ago, civic and community leaders from Kigumo petitioned the PM to visit the area and view the state of the roads and also listen to the tribulations of tea and coffee farmers. During the tour of Muranga, the PM will commission the Gacharage Tea Factory and address problems afflicting farmers in both agricultural and dairy sectors. The leaders listed a number of roads they wanted improved to help farmers ship their surplus produce to other marketing outlets that offered better pricing compared to those within their localities. The much awaited fresh voter registration exercise is set to kick off on March 22. Chairman Issack Hassan said the commission was expecting to register 18 million eligible Kenyan voters. “We will take one month to verify the names and possibly release to the country a new register in June,” said Mr Hassan. He said the commission had started receiving procured materials for the exercise and will next week gazette 44,383 clerks who will carry out the exercise. He however said the new voters’ card will be similar to the old ones in features. The registration exercise will be overseen by 17 regional coordinators and 210 Constituency Election coordinators. “The coordinators have finalised mapping the polling centres. We had asked them to propose any changes they think are necessary,” said the Chairman. The exercise is part of the reform agenda aimed at ‘restoring Kenyans’ faith in the electoral system. After the disputed 2007 Presidential elections results it was alleged that over two million dead voters’ cards were used to vote. The exercise is the second of the main mandates of the interim electoral body, after the establishment of a credible secretariat which the commission announced to have finalised. The two-year mandate for the commission ends in December this year or at the enactment of the new Constitution. The new law however proposes that in creating the new commission consideration be given to the need for continuity, giving the current commissioners a possible opportunity. The new register will give way for the two by-elections in South Mugirango and Matuga following the nullification of MPs Omingo Magara and Chirau Mwakwere respectively by the High court. Mr Hassan said the commission would conduct the by-election in June. He however warned that only those who voted in the two constituencies in the 2007 general election will be allowed to vote. “The only new voters we will permit are those who have just reached the age of 18 and have Identity cards. We are trying to stop the importation of voters,” he said. Speaker Kenneth Marende declared the South Mugirango seat vacant last month but is yet to issue writs for the Matuga seat. Foreign Affairs Minister Moses Wetangula is confident that the Grand Coalition Government will last the full term despite persistent wrangles. Mr Wetangula who was a member of the Kenya Dialogue and Reconciliation team said that no matter how deep rooted and frequently differences occurred in the government, most of those in the Cabinet were keen to hold it to the brink. “I have no doubts whatsoever that this coalition will last for the full term. There are challenges as it is common with coalitions in many other countries,” he told Capital News in an interview as the country prepares to mark the second anniversary of the signing of the National Accord on Sunday. He commended President Mwai Kibaki and Prime Minister Raila Odinga for their patience in controlling divisive views of their followers and still managing to push ahead with the government’s development agenda amidst the differences. “Even when spoilers appear to drive the government to veer off the rails, the two principals bring us back and remind us that we need to hold the country together,” he said. Mr Wetangula appealed to President Kibaki and Mr Raila to leave avenues of communication open for consultations to ensure that any matters within the government are resolved amicably. He also advised them to communicate regularly and conduct honest consultations that will give them solutions. Even though he recognises the important role played by the African Union, especially by Chief Mediator Kofi Annan, Mr Wetangula believes Kenya can manage its affairs without undue reliance on the international community to resolve minor issues. “Even in marriages, you will not like a situation which every time you don’t agree with your husband, he runs to call his mother or the wife calls her father. You have to learn how to live with each other, appreciate each others’ strengths and weaknesses,” he said. The Sirisia legislator said it was important for the country to show responsibility by taking up its leadership role seriously and practically. He also appealed to the Kenyan public for patience whenever disputes occurred. According to Mr Wetangula, a lot has been achieved for the two years it has been in existence. He asserted for instance that the reform process had already started. Mr Wetangula said he was happy that Kenyans would soon have a Constitution which covers most of the Agenda 4 issues of the mediation talks. He singled out a new Constitution as one of the major reforms that will cement the country and prevent violence in future elections. Agenda 4 consists of constitutional, institutional and legal reforms, poverty inequality and regional imbalances, unemployment among the youth, consolidation of national cohesion and unity, land reforms, transparency, accountability and impunity. The Minister said that most of them were already in progress and expressed confidence that the government will deliver them before the end of its term in 2012. Mr Wetangula was appointed to the mediation team to represent the Party of National Unity alongside Gichugu MP Martha Karua, Education Minister Sam Ongeri and Justice and Constitutional Affairs Minister Mutula Kilonzo. The Orange Democratic Movement had Deputy Prime Minister Musalia Mudavadi, Lands Minister James Orengo, Agriculture Minister William Ruto and Higher Education Minister Sally Kosgei. The team was led by a panel of Eminent African Personalities; Graca Machel- Mandela, and former Tanzanian President Benjamin Mkapa under the chairmanship of former UN Secretary General Kofi Annan. The chairman of Truth Justice and Reconciliation Commission Ambassador Bethuel Kiplagat has brushed off calls for his resignation and maintains that he sees no reason to quit. Ambassador Kiplagat who met members of the Parliamentary Committee on Legal Affairs insisted that he was fit for the job despite mounting pressure locally and internationally for him to step aside. “In view of these fundamental beliefs and more so as the chairman of a commission whose mandate is to address past injustices, I cannot merely step aside. Doing so would amount to condoning and encouraging the abuse of human rights, mine included,” he told the parliamentary committee sitting held on Friday. The former envoy told the committee that he believed any alleged wrongdoing levelled against him should be proven through due process and he would now seek to be enjoined in a case questioning his integrity to defend himself. “Since no one has brought any case against me and in order to clear my name, I am enjoining myself in a case already filed against the TJRC so that allegations leveled against me are determined in a court of law once and for all,” he said. On Thursday, 10 eminent past members of African truth commissions among them former South African Archbishop Desmond Tutu urged Ambassador Kiplagat to bow out of the chairmanship of the TJRC. Archbishop Tutu led the personalities in calling on Ambassador Kiplagat to step down on the basis of findings by two government bodies that he allegedly committed improper or illegal acts. In a statement sent from New York, they said there would be a conflict of interest with Ambassador Kiplagat’s role as TJRC chairperson and put the commission’s work and reputation at risk. But, Ambassador Kiplagat says although opponents of the TJRC have a right to express their opinion, they were not aware of personal and professional sacrifices he had made in his quest for peace and democracy. Despite doubts on his impartiality, Ambassador Kiplagat said his record spoke for itself. He said he had the capacity to get to the root causes of problems in this country, and find long lasting solutions. The TJRC was established to assess the history of human rights abuses in Kenya from independence and would inquire into events that took place between December 12, 1963 and February 28, 2008. Ambassador Kiplagat was accompanied to Friday's sitting by fellow commissioners including Betty Murungi, Tom Ojienda and commission secretary Patricia Nyaundi. Despite raging internal wrangles Prime Minister Raila Odinga’s Orange Democratic Movement is still the most popular political party. According to the poll conducted by Strategic Public Relations and Research and released yesterday, ODM enjoys a popularity rating of 51 per cent. This means ODM’s popularity rose sharply despite the intensified feud between party leader and Prime Minister Raila Odinga and his deputy and Agriculture Minister William Ruto. The poll conducted on February 18 and 19 shows that PNU lags behind in popularity at 20 per cent. A poll conducted by Synovate and released on January 8, showed ODM’s popularity was on the decline with 35 per cent of those polled supporting it. That same poll put PNU’s popularity at 20 per cent. According to the Strategic poll released yesterday, ODM-Kenya of Vice-President Kalonzo Musyoka has the support of four per cent, Narc three and Kanu and Ford-Kenya at a low two per cent each. SPRR’s Chief Executive Officer Ceaser Handa, who released the report at a Nairobi hotel, said the seeming lack of effect of the ODM wrangles on its popularity could be explained by the fact that Raila and Ruto’s supporters also support ODM. 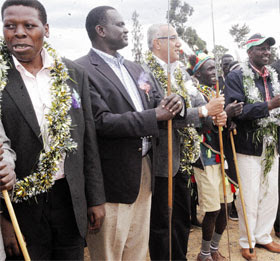 "The reality on the ground is that ODM is the most popular party," Mr Handa said. The poll did not, however, show what percentage supported Raila, Ruto or any other ODM politician. At the same time, the polls shows 55 per cent of Kenyans trust the PM to lead the fight against corruption. Only 14 per cent trust President Kibaki, while five per cent trust Vice-President Kalonzo. Four per cent trust Environment Minister John Michuki and Justice Minister Mutula Kilonzo in the fight against graft while only three per cent trust Gichugu MP Martha Karua and Attorney General Amos Wako. Handa attributes the trust in Raila on "the bold move" he took in suspending Ruto and Education Minister Sam Ongeri. "The PM made a bold move and took action that Kenyans want to see happen. They feel he has what it takes to fight corruption," Handa said. According to the research 70 per cent of Kenyans support the PM’s move to suspend the two ministers while 75 per cent do not approve of the President’s action to rescind Raila’s action and reinstate the two ministers. At the same time, corruption has overtaken constitution making as the most important issue. According to the poll, 35 per cent of Kenyans feel corruption is the most important issue followed by political instability (29 per cent). Only nine per cent of those polled rated constitutional review as most important. Eighty two per cent want ministers and senior Government officials accused of corruption fired and prosecuted while only 7.4 per cent feel that they should simply be warned and let to continue discharging their duties. Six per cent want corrupt officials to face the death penalty. The report also indicates that 17 per cent of Kenyans have become disillusioned with political parties. Handa attributes this to internal wrangles in political parties. "The 17 per cent figure is significant as it indicates that some Kenyans are trying to find new political homes. There is a suggestion that new political parties could be formed," Handa said. The power sharing arrangement is still unpopular according to the opinion poll. Eighty three per cent of Kenyans are not happy with the power sharing arrangement in the coalition pointing at lack of understanding and co-ordination between the two principals in handling national issues. Eighty-four per cent of Kenyans feel that the Government has not taken necessary steps to effectively fight corruption as 51.6 per cent are satisfied with improvement of roads. When contacted for comment on the poll, the PNU Spokesperson Moses Kuria dismissed it as an ODM ploy to hoodwink the pubic. "If you look at what is happening in Parliament, where they have lost the majority, you will understand what is happening in the country," he said. Mr Kuria said it was unlikely that Raila would score high in the fight against corruption yet two officers from his office recently stepped aside over allegations on corruption. Strategic PR polled 1,600 respondents and used a questionnaire administered face to face. The Kenyan Government is exploring the possibility of designating February 28 a national holiday to commemorate the signing of the National Accord. If adopted, the day will be known as the National Thanksgiving and Cohesion Day and will be celebrated every year. The Nation learnt that the idea was mooted on Thursday at a meeting between President Kibaki, Prime Minister Raila Odinga and members of the National Cohesion and Integration Commission at Nairobi's Harambee House. Vice-President Kalonzo Musyoka and Justice minister Mutula Kilonzo also attended the event. Sources familiar with the deliberations, however, said the matter was still under discussion and that no conclusive decisions had been made on it. The chairman of the commission, Dr Mzalendo Kibunja, and commissioner Halake Waqo said the day should be commemorated as it was a symbol of hope. Mr Waqo said a national prayer day had consequently been organised for this weekend to commemorate the signing of the accord brokered by former UN boss Kofi Annan and his panel of Eminent African personalities. There will also be a joint statement from the two principals. The PNU coalition starts its retreat in Naivasha on Friday after agreeing to discuss the draft constitution, which goes before Parliament next week. The party shelved discussions on the formation of a new political movement, according to its executive director, Mr Jasper Nyamboga. About 70 MPs and most of the 22 coalition parties have confirmed their attendance. Officials from different affiliate parties are also expected although four parties – among them Kanu, DP and CCU – have in the past week distanced themselves from the talks. Mr Nyamboga said the meeting would not discuss matters relating to the 2012 General Election. “We had a meeting last night (Wednesday) and 70 MPs confirmed attendance. We want to say that the meeting is not aimed at disbanding any party but will explore ways of strengthening the union,” said Mr Nyamboga. Insiders who attended the Wednesday meeting said it was resolved that due to concerns raised over the talk of a new party, the idea should be shelved. It was decided that the matter would be revisited once wider consultations had been made. Key leaders from PNU, Kanu and ODM-K, including Deputy Prime Minister Uhuru Kenyatta and Internal Security minister George Saitoti are expected at the meeting. Also expected to attend are Ford Kenya leaders Moses Wetang’ula and Eugene Wamalwa, as well as Kinangop MP David Ngugi, who will represent the smaller parties in the PNU coalition. One of the organisers of the retreat, to be held at the Great Rift Valley Lodge, said ways of exploiting the rift within ODM following the fallout between Prime Minister Raila Odinga and Agriculture minister William Ruto would be explored. A vote recount for Starehe entered its second day on Thursday with the sitting Member of Parliament trailing by 666 votes. Bishop Margaret Wanjiru had 328 votes against 994 garnered by Mr Maina Kamanda, her closest rival in the 2007 poll. So far, only votes from City Primary School are being scrutinised. And, like on the first day, anomalies continued to emerge. Two ballot papers bearing the name of one voter but belonging to different constituencies were found in one box. The papers were for Kamukunji and Starehe constituencies. More than 200 ballot boxes will be opened in the scrutiny. So far, only three have been opened. The scrutiny of the votes was ordered after Mr Kamanda went to court to challenge Bishop Wanjiru’s win in the last parliamentary elections, citing irregularities. On Wednesday, Mr Kamanda was in the lead with 407 votes while Bishop Wanjiru had 90. This puts the total votes recounted so far at 1,401 for Mr Kamanda and 418 for Bishop Wanjiru. Mr Kamanda pleaded in his petition that the boxes be opened and votes recounted, saying the election was rigged through falsification of forms 16A. The petitioner was a former Sports minister until he lost his parliamentary seat in the last elections. Bishop Wanjiru, who is also Housing assistant minister and vied on an ODM ticket, beat PNU’s Mr Kamanda by 895 votes. The election, which led to violence that killed more than 1,000 people, was seen as the most contested. Out of the 39 petitions filed, some 25 have been dismissed on technicalities. A recent ruling saw Transport minister Chirau Mwakwere lose his Matuga seat. Other pending petitions include Wajir South, where a scrutiny of votes has been ordered beginning March 1. ODM has managed to exclude Cabinet Minister William Ruto from the all-important parliamentary House Business Committee after MPs voted unanimously to pass its list of members. Though the membership of the House Business Committee remained as initially tabled on Wednesday, most MPs who rose to contribute spoke in its support. The committee is crucial in parliament as it is the one that schedules business for the House. The MPs shouted 'aye' to show their unanimous support when Speaker Kenneth Marende called the procedural motion to vote. This was a major climb-down from supporters of Agriculture Minister William Ruto who had cried foul when the list was initially tabled. Kenneth Marende - Speaker (Ex-Officio Member). Ten eminent past members of African truth commissions have urged besieged Ambassador Bethuel Kiplagat to bow out from the chairmanship of Kenya’s Truth Justice and Reconciliation Commission. Archbishop Desmond Tutu, former Chairperson of the South African Truth & Reconciliation Commission led the personalities in calling on Ambassador Kiplagat to step down on the basis of findings by two government bodies that he allegedly committed improper or illegal acts. In a statement they said there would be a conflict of interest with his role as TJRC chairperson and put commission’s work and reputation at risk. Director of International Centre for Transitional Justice (ICTJ) Africa Program Suliman Baldo who hosted the meeting by the personalities said "If the TJRC is to be effective, it has to be free of any taint of real or perceived bias and impropriety." "To safeguard the commission’s work, we believe these international justice figures are exactly right in calling for the chairperson’s resignation." chairperson of the Truth and Reconciliation Commission for Sierra Leone), Salomon Lerner Febres (the former chairperson of the Peruvian Truth and Reconciliation Commission) and Alexander Lionel Boraine (Chairperson of the Mauritian Truth & Reconciliation Commission). We, former chairpersons and commissioners of truth commissions from around the world, respectfully call upon Ambassador Bethuel Kiplagat, Chairperson of the Truth Justice & Reconciliation Commission’s (TJRC) to step down from his positions as Chairperson and Commissioner. We are deeply troubled by serious allegations of bias and misconduct that have been made against Chairperson Kiplagat. The allegations about his role in the former Moi government have generated a widely held perception that he labours under an unavoidable conflict of interest and that he is unable to bring an impartial mind to bear on his important duties as TJRC Chairperson. We are advised that in previous years, a statutory Commission of Inquiry as well as a Parliamentary Committee of Inquiry have made disturbing findings against Ambassador Kiplagat on matters that fall squarely within the TJRC’s mandate. The Report of the Commission of Inquiry into Illegal and Irregular Allocation of Public Land (released in 2004) makes references to instances of the illegal acquisition of public land on the part of Ambassador Kiplagat. The Report of the Parliamentary Committee of Inquiry into the Murder of Dr. Robert Ouko includes a report from an investigation team which concluded that Ambassador Kiplagat was untruthful in his submissions. While Ambassador Kiplagat has disputed the references to him in these reports, they nonetheless have a direct and serious impact on public perceptions in relation to his fitness to hold high office in the Commission. All truth commissioners must be seen to be upholding the highest standards of ethics and integrity. They need to be seen to be scrupulously independent and objective. We are constrained to point out that Ambassador Kiplagat does not meet these essential standards. We note that truth commissions must enjoy the confidence of the public to succeed. Since objective grounds of a reasonable apprehension of bias on the part of Ambassador Kiplagat exist in the minds of the public, he is duty bound to resign for the greater good of the commission and country. We believe that if the current state of affairs is not addressed the TJRC will not be able to deliver truth, justice and accountability for past injustices and gross human rights violations. For these reasons we call upon Ambassador Kiplagat to immediately step down so that the TJRC may proceed with its critical tasks of promoting justice and combating impunity in Kenya. Since the Commission began its preliminary work early this month, it has been met by public walkout who were demanding the resignation of Kiplagat. The Civil society has sustained calls for Ambassador Kiplagat since his appointment and last week the Kenya Human Rights Commission alleged it had evidence to link Ambassador Kiplagat to some of the violations and gave him a seven-day ultimatum to step aside. Chief Justice Evan Gicheru is also expected to appoint three judges to a hear case in which a number of former MPs are questioning the eligibility if Ambassador Kiplagat’s leadership. The besieged commission has been holding crisis meetings to seek a way forward, as it become more apparent that the validity of its work is at stake. The last of the meetings was held on Wednesday. The commissioners are said to be divided right in the middle over whether the chairman should step aside. Ambassador Kiplagat has maintained that he will not step aside and shoved off accusations that he was involved in any atrocities by the former regime. Justice and Constitutional Affairs Minister Mutula Kilonzo is also on record defending the Chairman and accusing the civil society activists of failing to use laid down structures to raise their objections. The Minister said the government would not take any action since he was not a government employee but was recruited through a process in which the civil society was one of the key participants. A panel comprising members of the private sector and the civil society had recommended Ambassador Kiplagat alongside former Anglican Bishop Benjamin Nzimbi and Rev Timothy Njoya for the post of chairman. The Parliamentary Committee on Justice and Legal Affairs settled on Ambassador Kiplagat and his appointment was subsequently passed by MPs. Raila Odinga appeared to retreat to avoid a looming battle with PNU over who should be leader of Government Business in Parliament. ODM’s move not to include his name on the House Business Committee puts him out of the running for the position he had gunned for. The PM’s allies also seemed to be attempting to kill two birds with one stone by removing Agriculture Minister William Ruto and two of his allies from the committee. 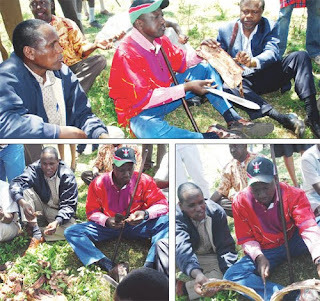 Mr Ruto, who is also Eldoret North MP, has turned out to be the strongest critic of Raila within ODM. Yesterday, the row in the House centred on whether there were consultations before the changes were made. But an ODM MP who did not want to be identified said: "The bigger picture in the scheme is the attempt to save face for Raila by avoiding the battle with PNU." He also added there was fear within ODM circles allied to the PM that a censure Motion could easily be tabled in Parliament. "That is why they removed the names of Ruto and the other two MPs and replaced them with supporters of the PM," the MP told The Standard. Kigumo MP Jamleck Kamau (PNU) who has a pending Motion on who should be leader of Government Business in Parliament said he would go ahead with his Motion. "My Motion is on course and I am certain we will win to allow the President to appoint the leader of government business," he said. Mr Kamau said the crisis in ODM should not be allowed to paralyse parliamentary business and called on the party leaders not drag their disputes to derail functions of the House. Raila’s absence from the committee will mean he would have given up the chance to contest for the position since he would have to be a member of HBC to qualify for the position. In 2008, after the Grand Coalition Government was formed, there was a standoff in Parliament when the PM said he had appointed himself to the position, clashing with President Kibaki, who had appointed Vice-President Kalonzo Musyoka to the position. National Assembly Speaker Kenneth Marende put the dispute in suspension after he ruled he would act as chairman of the HBC until the two coalition partners reached an agreement. Mr Marende’s ruling was widely hailed for ending a disagreement that threatened the coalition. Indications the PM was planning to throw in the towel emerged on Monday when he met ODM ministers at his Treasury office. Raila is said to have told the ministers that he had given up desire for the position because he "has a busy schedule". Two ministers and close allies of the PM are said to have disagreed with him over the decision. Yesterday, ODM chief whip Jakoyo Midiwo said: "The PM is too busy to represent the party in the HBC, in fact he hardly attends the meetings, so there was no need to keep him". Due to the rifts in ODM pitting Raila and Ruto, PNU was poised to win the contest after allies of the agriculture minister gave indications that they would vote with the president’s party. Political Science Lecturer Adams Oloo says the move by ODM appears to be an attempt to position the party to fight even at the level of the HBC. "It looks that ODM plans to fight even the Motion over Leader of Government Business at the level of the committee and defer it to another time when its wrangles could have subsided," he said. On the removal of Ruto, Dr Oloo said the action might have been informed by the current rift between the minister and the party leader. Besides the contest over who should be leader of government business, there are signs that PNU feels rejuvenated and is ready to take on its coalition partner inside the House unlike the previous sessions when ODM had the upper hand. ODM was on Wednesday thrown into a crisis meeting following acrimony caused in Parliament following change of its members of the House Business Committee. The party held an impromptu parliamentary group meeting that was attended by its leader Raila Odinga to respond to the issues raised in floor of the House. More than 50 MPs who attended the meeting at Orange House however agreed that the list presented to the House by ODM chief whip Jakoyo Midiwo would not be changed and vowed to support it in Parliament. Mr Odinga, Agriculture Minister William Ruto and North Horr MP Chachu Ganya were among those replaced by the party as members of the House Business Committee causing disagreements in Parliament. The PG was not attended a number of MPs including Chepalungu’s Isaac Ruto who opposed the new list in Parliament as they were attending another meeting on constitution at County Hall. Addressing journalists after the meeting, Mr Midiwo maintained the list which he had tabled in Parliament Wednesday morning was final. HBC is a crucial committee charged with the task of drawing up Parliament’s day to day business. Mr Midiwo insisted that the choice of the committee’s members was the prerogative of the party and that nobody will dictate to ODM who to sit in the committee. “All members of ODM are equal, there are no special members, even the Prime Minister has been removed from the committee,” Mr Midiwo stated when asked why the party had replaced Mr Ruto. The Gem MP further stated that he had consulted the PM, the party chairman Mr Kosgey and Secretary General Prof Nyong’o before coming up with the list. “I have no apologies to make, I made the list after consultations and I’m not going to change anything,” he added. Mr Midiwo explained that Mr Odinga, Mr Ruto and Mr Ganya were replaced over poor attendance of the HBC meetings. “The PM makes technical appearance to the meetings...same to Ruto,” Mr Midiwo said. He warned that there’s no way only ODM list of nominees could be rejected saying “if rejected, the MPs would have rejected both (ODM and PNU’s). He warned that no business of the house could be conducted in next six months if the lists are rejected, a thing that could force the country to elections. “Kenyans need some crucial issues addressed and not frequent squabbling,” he said. Admitting that there were wrangles in ODM with some leaders competing, Mr Midiwo however said he did not require their unity or harmony of ODM to work. He said Kenyans need to a new constitution, fight corruption and end impunity. “Kenyans want changes,” he said. The PG meeting was chaired by Mr Odinga who however left before it ended. In the new list of HBC, Mr Ruto was replaced by Industrialisation Minister Henry Kosgey who is the ODM chairman while Medical Services Minister Anyang’ Nyong’o took Mr Odinga’s slot. Nyaribari Chache MP Onsare Monda was also replaced by his Bonchari counterpart Charles Onyancha. Wrangles in the Orange Democratic Movement have spilled into Parliament and stalled the reconstitution of the powerful crucial House Business Committee. Parliament was forced to adjourn prematurely on Wednesday barely 30 minutes into the sitting after MPs disagreed on the membership of the committee. Chepalungu MP Isaac Ruto kicked off the storm when he stood to oppose the membership claiming that there were no party consultations as required by the standing orders. ODM has replaced perceived rebel MPs William Ruto and Chachu Ganya in their list. Also missing in the list is Prime Minister Raila Odinga who has been replaced with ODM secretary general Anyang’ Nyong’o, perhaps indicating he has dropped the bid to chair the HBC. “I don’t expect my Party (ODM) to call for delegates conference, but I expect some consultations which I am sure have not taken place,” said Mr Ruto who is a key ally of Agriculture Minister William Ruto. Party whip Jakoyo Midiwo maintained there were consultation and claimed that “Mr Ruto had not been attending meetings faithfully.” Mr Ganya who was in the house however dismissed the assertion. “What (Mr) Midiwo is referring to was not consultations but a meeting,” he said. Members, mostly backbenchers joined Isaac Ruto in dismissing the procedural motion. “Political party democracy is very important. We should not take it for granted that parties do not belong to a few leaders of the party whips. Parliamentary group meeting must be called and consensus must be reached,” said Livestock Assistant Minister, Adan Duale. Lands Assistant Minister Bifwoli Wakoli however differed with his colleagues saying it is wrong to try and sort out party problems in the House. “It is time if we have problems with our party leaders we go and remove them,” he charged. “To bring sanity into this and for us to appear to be doing what we are supposed to be doing we must oppose this list,” said Mithika Linturi, who claimed he was not consulted as the KANU party whip. During the constitution of the same committee last year the same scenario played in the house as backbenchers claimed they had been sidelined. The whips were forced to withdraw the list and include a number of backbenchers. The conflict between the Agriculture Minister and party leader Raila Odinga has escalated in the last two weeks after the unsuccessful attempt by the Premier to suspend Mr Ruto over corruption allegations. Rifts have emerged in the party with the defiant Agriculture Minister enjoying the support of over 20 MPs mostly from his Rift Valley home turf. The HBC sets the agenda for the House. Ex-officio Member, Speaker Kenneth Marende chaired it on a temporary basis after both the PM and Vice President Kalonzo Musyoka laid claim to the seat in the last session. President Mwai Kibaki has called on the National Cohesion and Integration Commission to identify the cause of emerging inappropriate behaviour that was a threat to national cohesion and integration. President Kibaki made the remarks when he met and held discussions with Commissioners of the National Cohesion and Integration Commission at his Harambee House Office. The President observed that new undesirable behaviours were creeping in society which not only undermined but also acted as an impediment to national cohesion. He asked the Commission to seek ways of stemming this unwarranted behaviour. 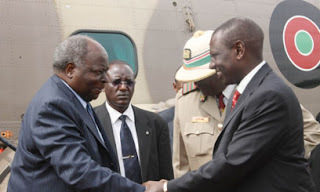 President Kibaki cited politicisation of funeral ceremonies, intolerance and spreading of hate speeches as some of the many undesirable behaviours that need to be curtailed in order to build a stable, prosperous and harmonious nation. During the occasion, the Head of State assured the Commissioners of the government’s financial and logistical support to enable them to execute their broad mandate. The President reiterated that Kenya is indivisible and belonged to all citizens who must enjoy the right of living and working in any part of the country. Justice, National Cohesion and Constitutional Affairs Minister Mutula Kilonzo asserted the need to strengthen the Commission ahead of the forthcoming referendum on the new constitution to curtail undesirable behaviours that could cause ethnic animosity. The Commission Chairman Dr Mzalendo Kibunjia affirmed that the organisation was committed to developing national values such as patriotism, hard work, self-drive among others which should be exposed to Kenyans from an early age. He said that the Commission had proposed February 28 to be dedicated as a national thanksgiving and cohesion day due to its historical importance to the country after the signing of the National Accord. Dr Kibunjia revealed that the commission had also commissioned a study to unearth the facts and reasons behind lack cohesiveness among some Kenyan communities with the intention of building vital linkages for national integration. He noted that the commission had initiated the process of interacting with Kenyans and engaging stakeholders in order to start the process of changing negative attitudes that undermine national cohesion. The Prime Minister Rt Hon Raila Odinga and Vice-President Hon Kalonzo Musyoka attended the meeting among other senior government officials. Later at his Harambee House Office, President Kibaki met and held discussions with the international women’s tennis superstar Serena Williams. Ms Williams commended the President for his contribution to the success of the Free Primary Education programme. President Kibaki noted that education laid a firm foundation not only for the individual pupils but also the country’s future. He expressed the commitment of the Kenyan Government in ensuring that the FPE programme was successful in order to continue giving children from disadvantaged backgrounds an opportunity to change their situations and contribute towards national development. Ms Williams is in the country to inaugurate Wee Secondary School established in Matiliku Location, Makueni constituency an area faced with high school dropouts due to harsh environmental conditions. The President expressed his appreciation for her contribution to Kenya’s education sector. The tennis star commissioned the first school in Mutyambua location in November 2008 upon learning about the President Kibaki’s commitment to the provision of education for all in the country. The schools have been built in conjunction with global IT firm, Hewlett Packard and an American non-profit making organization, Build African Schools. Ms Williams is the global ambassador for Hewlett Packard. The making of a new constitution has now shifted to Parliament after the Committee of Experts on the constitution (CoE) handed over a refined draft with minor changes to MPs. The Parliamentary Select Committee on Constitution review received the document with a promise to ‘carry into Parliament the spirit of consensus building’ that has so far guided the process. In the new document the experts restored restricted legislative functions to the senate as it will now debate and approve Bills relating to the counties and the impeachment of the President and his Vice President. Further, the experts have reinstated the requirement to vet all judges but gave a provision that Parliament shall within one year of the new law enact a legislation to outline clear mechanisms and procedures. “Our role is to complement your roles by bringing to your attention matters that may easily be lost in the politics of the day,” said CoE Chairman Nzamba Kitonga while defending the changes. The experts retained the much of the original Bill of Rights that the PSC was accused of diluting. They have also reinstated a provision to create a Commission of the Implementation of the Constitution to guide the enactment of the new law and reintroduced the Commission of Revenue Allocation. The team on the other hand retained the Presidential system, a two tier devolution and outlawed abortion. The debate on abortion has been rife since the release of the Naivasha document with pro-choice campaigners saying the definition of life should not entrenched in the constitution. While receiving the draft, PSC Chairman Abdikadir Mohammed promised that his team would remain united in pushing for its adoption in the house. He exuded confidence that that the house was ‘up to the task’ of delivering a new constitution to the country on time. “I assure you that we will conclude the remainder of the process as successfully as we have completed the rest of the process,” he said. Vice Chairman Ababu Namwamba also expressed confidence that the debate in the House would remain cordial and fruitful. “The spirit of consensus building, the spirit of forgetting our differences and hoisting the nation above everything else will continue to guide us,” he stated. The PSC now has one week to submit the draft to Parliament for debate and adoption. The House will debate the law for 30 days before passing a vote. MPs can only alter the draft by a two thirds majority. The House was recalled a month ahead of schedule to debate the new law. While officiating the 4th session of the Tenth Parliament, President Mwai Kibaki urged parliamentarians to rise to the occasion and give the nation the much awaited law. Cabinet minister Chirau Mwakwere took members of staff by surprise when he arrived in full official gear and went about his duties at the Transport ministry. This was the first time the minister showed up at the ministry since the High Court in Mombasa nullified his election as Matuga MP. Mwakwere summoned all departmental heads to a meeting, which he chaired, to discuss official matters. "He arrived in the morning and went about carrying his duties. He even chaired a meeting, which was also attended by the PS Cyrus Njiru and Head of Administration Philomena Koech," said a source who could not be named. The source added the top officials quickly consulted legal experts before agreeing to attend the meeting. "We were taken by surprise by the arrival of the minister leave alone summoning us all to a meeting," said one of the officials who, however, declined to discuss details. Another official said Mwakwere wanted an update of what had been going on in the ministry "while he was away". "Technically, the minister has lost it unless he lodges an appeal against the High Court verdict, but legally, he remains a minister until the Speaker declares his seat vacant," said a top ministry official. He added: "The President too cannot replace him before the Speaker declares the Matuga seat vacant". Ruto has nothing to fear. President Kibaki used the official opening of Parliament to reply to Prime Minister Raila Odinga over how not to resolve coalition disagreements. And the President made it clear that local problems are best solved using local institutions — a dig at the PM and his Orange Democratic Movement party for seeking the intervention of the international community over coalition disagreements. In his traditional way of not answering his political opponents directly, the President said: "Kenyans should trust the leadership of the country and abandon the temptation to look externally for solutions that can easily be found locally." Recently, the Prime Minister penned a letter to the African Union seeking its intervention and that of former Chief Mediator Kofi Annan over sharp disagreements occasioned by Raila’s controversial suspension of two ministers and the subsequent annulment by Kibaki. Raila had announced the suspension Agriculture Minister William Ruto and his Education counterpart Prof Sam Ongeri over the maize subsidy scandal and loss of more than Sh100 million from the Free Primary Education kitty. Yesterday, the President said his Government was committed to the fight against corruption but that the war should not be politicised. This was also in apparent reference to Raila who was widely considered to have taken drastic action against Ruto, his erstwhile ally turned critic within the Orange party. "In order to win this war, we must apply the law in a manner that is impartial and just. We must also not politicise or personalise the fight against corruption," Kibaki told members amid applause from his party, PNU. At Parliament, the two leaders were meeting for the second time yesterday since their controversial spat over a week ago. Prime Minister Raila Odinga (left) and President Mwai Kibaki. Earlier in the morning, Kibaki and Raila met at Harambee House for briefing before the State opening of the Fourth Session of the 10th Parliament. And back at the House, the President stressed the Government’s resolve to deal with corruption — a concern he noted had topped national debate for many years — decisively albeit within the confines of the law. The infighting in ODM, however, continued as sources told The Standard last night that Ruto’s name had been removed from the membership of the powerful House Business Committee that sets the agenda of the House. The sources said Ruto, who has been a member of the committee since the 10th Parliament was inaugurated, had been replaced with Industrialisation Minister Henry Kosgey, who is also the ODM chairman and a close Raila ally. In Parliament, Ruto sat at the far left edge of the second last row next to Ndaragwa MP Jeremiah Kioni, and could be seen engaging in prolonged foot thumping as the President delivered his speech. Corruption, President Kibaki said, undermined Government policies, distorted allocation of public resources and gave the country a poor image as well as discouraging investments. The war against graft had been intensified in the last few months, said the President, adding that the momentum would be accelerated to cover all vulnerable sectors of government. Kibaki directed all anti-corruption agencies to fast-track and conclude pending corruption cases. He instructed the Judiciary to speed up the trials because quick conclusion of corruption-related cases was a key pillar in this fight. "The Government is also consulting with the Judiciary on ways of placing a time-frame on the period within which a corruption-related case should be concluded," Kibaki said. The public service, he added, had been directed to apply the law and regulations firmly and impartially. On Constitution review, President Kibaki said the Parliamentary Select Committee (PSC) had done a good job at the Naivasha retreat. "We seem very close to this goal," said Kibaki in reference to the work done by the Committee of Experts. "We are looking forward to the presentation of a consensus draft Constitution to this august House by the PSC in the next few days." He said: "This Tenth Parliament has a historic opportunity to rise to the occasion by passing a new Constitution for the Republic of Kenya. We must be successful in this endeavour at this defining moment in our nation’s history". He urged the House to maintain a national consensus on the new Constitution, and ensure the people of Kenya will stand united during the referendum to be held later this year". Kibaki said in his nearly half a century as a legislator, "there had not been a Session of Parliament with the potential to bring as much positive change to Kenya as this one". He told MPs "to shun divisive partisan politics" and "focus on the greater good of our country" a statement seen as a reprimand even to his party PNU that is plotting with rebel ODM members against the PM. "Whatever differences may arise between us should be amicably resolved in the national interest". He expressed confidence the House "is up to the task" and that "it will fulfill its national duty and secure a memorable place in history". The President spelt out the heavy Government legislative agenda to be tabled in the House to speed up reforms. On police reforms, two Bills — Independent Policing Oversight Commission Bill and Police Reforms Bill — are lined up. The family of former TV news anchor Esther Arunga who has dominated news headlines since last week has finally managed to separate her from the controversial Finger of God church, at least for now. Ms Arunga who was arrested on Saturday morning alongside Finger of God Church leader Joseph Hellon, Quincy Timberlake and five of their members was released early Monday before the rest were arraigned in court. Mr Hellon, Mr Timberlake and the five others denied charges of being members of an illegal society and were freed on a bond of Sh20,000 each apart from Mr Timberlake. The court was urged not to grant Mr Timberlake bail because he had absconded court in another criminal case which was pending before a Makadara court. On Tuesday, a family member told Capital News that Ms Arunga was “at home and is doing quite fine.” “She is undergoing counselling sessions and will be okay, she has no problem at all,” the family source said. Ms Arunga who recently announced she had resigned from KTN as a news anchor to join the now infamous Finger of God Church has dominated local news with bloggers debating if the church she joined was a cult. Police have indicated that they would use her as the prosecution witness to testify against Hellon, Quincy and the rest of the church members who appeared in court on Monday and Tuesday. Police raided Mr Hellon's house in Gigiri at 2am on Sunday and arrested the two and other followers of the controversial Finger of God ministry based in Nairobi's Runda estate. The suspects were locked up in various police stations in Nairobi. Ms Arunga who spent Sunday night at Muthaiga police station was released on Monday morning on a police bond. It is with great pleasure and honour that on behalf of the entire membership of the House, I welcome Your Excellency and all Distinguished Guests to the State Opening of the Fourth Session of the Tenth Parliament today. This day is specially by practice, tradition and custom at your disposal to pronounce to the Nation the Government’s legislative agenda during the Session. I wish, however, advisedly to make use of this unique and important opportunity to say a few things about the Legislature and the Parliamentary Service Commission. To begin with, let me thank Your Excellency for the generous and unflinching support you have personally given to the Parliamentary Service Commission over the years including officially launching the Commission’s Strategic Plan for the period 2008-2018 on 13th February last year at the Safari Park Hotel. The Strategic Plan summarises the reforms the Commission intends to carry out in the Legislative arm of Government so that our people can have a Parliament that is empowered to make that will anchor and promote good governance and assist the country attain Vision 2030. We live in a fast changing world such that parliament is obligated to enact laws that enable it keep abreast with adequate capacity to discharge its constitutional mandate effectively and remain relevant in step with the citizenry responsive to the latter’s concerns and tribulations. The Parliamentary Service Commission is committed to ensuring that Parliament remains a public watchdog with teeth to bite any public servant unwilling to conduct public affairs in accordance with the law. In particular, Agenda Four of the National Accord has specific targets which the National Assembly is expected to actualize. These include electronic voting, live television and radio broadcasts of the proceedings of the House and its Committees, etc. I am happy to report that we have had the necessary financial and technical support from the Government to carry out extensive renovation of the Chamber to facilitate the smooth installation of the requisite equipment to make this happen. The renovation works will soon commence and the sittings of the House will shift to the old Chamber which is much smaller than where we are. The renovation is expected to last roughly one year and I plead that Honourable Members gracefully bear some inconveniences that are unavoidable in a project of this nature. It is worthy of mention and significant for the House and, indeed, the whole country, to note that when the Commission was first established in the year 2000, Your Excellency was among the first ten Commissioners. Your pioneering role in the Commission was instructive in laying the firm foundation I and my colleagues 10 Commissioners found when I became the Chairman two years ago and we are proud of your indeligible role in pioneering execution of the Commission’s mandate. This, to me, explains why the Parliamentary Service Commission and the Executive arm of Government have largely read from the same script with respect to implementation of projects since you ascended to the leadership of this country. We commend you, Your Excellency, for the warm understanding and close co-operation that we have enjoyed with your Government. Although prima facie the House would seem to have passed fewer Bills during the 3rd Session than it did in the 2nd Session, the House was instrumental in consolidating our nationhood and cohesion by jump-starting the operations of the various Commissions to commence and carry out their specific mandates either contained in the Agenda Four of the National Accord or under the general reform measures the Government has undertaken to institute. Beyond the foregoing, Parliament commendably, through its bipartisan Parliamentary Select Committee rose to the occasion and the national challenge of the time when the Committee of Experts on the Constitutional reform handed over its report to it. Pursuant to the provisions of the Constitution of Kenya Review Act the Committee went into a retreat in Naivasha and against all possible cynicisms put Kenya first and came up with an agreed position, produced an agreed, if not improved, harmonized Draft Constitution. The Jury is still out on whether or not they did well but as to where we are felicitation is in order. Kenyans yearn for reforms because they love their country. They want peace in the hope and expectation that their aspirations for development, good governance and better life would be realized in their lifetime and that they will in turn bequeath these to their children and children’s children and on to prosperity. Kenyans have for many years hosted refugees at immense sacrifice and we are therefore disenchanted with the continued presence of IDPs in their midst. We must do all that it takes to reverse this enigma with us Hon. Members in the forefront to bring about the necessary if not essential reforms to reverse this. This country is ready to move forward. What our people expect of us, especially as their elected representatives sitting in this House, is leadership. Our people would like to see the leadership of this country stand firm in defending our national values as enshrined in our national anthem. The people of Kenya have accorded us the privilege to be their elected representatives so that subscribe to and uphold their dignity. At this juncture, I would like to appeal to Members to approach the debate on the new Constitution with full soberliness. We have no reason nor business, to call each other names merely because of a difference in opinion or stand on a given article or clause in the harmonized draft Constitution, we shall stand accused of confusing the public or worse still, of sowing seeds of discord, disharmony and animosity among our people. In Constitution making, Parliament is comparable to the Court of Appeal because the final draft that will go to the public for adoption through a referendum will be approved by this House. A Court of Appeal does not begin to consider a case until its seized of it. It is in this House that it matters. We must stop all those antics, shadow boxing at all manner of fora including pre-wedding parties. Men and women of substance must and will be heard here where it counts. The changes all of us would like to see in the harmonized draft should be subjected to mature debate. Members would do a great job for this country if they spent most of their time listening to what the people are saying instead of advocating to the public what they want removed from the draft, etc. My parting shot on this subject I quote from an eminent 18th Century American lawyer. Every politician - and all Hon Members are politicians - have ambition to capture state power through the electoral process and form or be part of the Government. The people of Kenya expect you to give them a Constitution which will restrain the Government from unnecessarily interfering in their affairs and NOT to restrain them from prying into Government affairs. The new Constitution we must have will be measured against this primary bench mark. Your Excellency, this far I may sound idealistic but I must confess that I am a dreamer awake to the reality that Government is the greatest reflection of human nature and that men and women of whom politicians are part, are not Angels for if they were no Government would be necessary. Our focus therefore has to be, to give it our all so that Kenyans have premier leadership. You are the longest serving Member of this House and with that unique unparalleled tenure, you have direct personal knowledge, skills and experience on parliamentary procedures and diplomacy. In the year 2006, the National Assembly successfully hosted the 114th Inter-Parliamentary Union meeting in Nairobi. The Government played an indispensable role in ensuring that the meeting was a resounding success. During my tour at international parliamentary meetings, I have met several delegates who came to Nairobi for the I.P.U. meeting in 2006. They still cherish fond and fresh memories of Kenya and its people who they say are warm, friendly and kind. Once again in the month of September this year, we are going to host the 56th Commonwealth Parliamentary Association Plenary meeting here in Nairobi. The Government has already assisted the National Assembly in several ways to ensure the successful hosting of the Commonwealth Parliamentary Association meeting. We shall Your Excellency, keep you posted as we progress towards the meeting since your personal experience and advice on all this is peerless. And we value it. As a country we must live up to our reputation to always going for the best. If not emerging the best. It is now my pleasure and privilege to invite you to address the Nation from the August House. President Mwai Kibaki on Tuesday held talks with Prime Minister Raila Odinga at his Harambee House office. The two Principals were meeting for the first time since the impasse in the coalition government over suspension of Ministers William Ruto and Sam Ongeri. During the consultations they were also joined by the Speaker of the National Assembly Kenneth Marende and the two chief whips Jakoyo Midiwo and George Thuo. The consultations centered on a wide range of issues touching on the Grand Coalition Government. They also discussed the government agenda ahead of the State Opening of the 4th Session of the 10th Parliament. They agreed on the need to give priority to the constitution making process in order to give Kenyans a new and unifying document. It is my pleasure to welcome Honourable Members to the Fourth Session of the Tenth Parliament after a two month recess. I am sure this well deserved recess gave you time to replenish your energy, consult with your constituents, and support development activities in your constituencies. This House is reconvening at a particularly important time in which we are steadily overcoming the challenges we have faced in the recent past. It is also a time when we are implementing bold reform measures that will define the future of our country and people. This is, therefore, a critical time that demands our selfless and dedicated service to our people. Furthermore it is a time when the future of our country so much depends on our ability to forge a common vision for national unity, development and cohesion. God bequeathed us a beautiful country with a determined and patriotic people. We should therefore always cherish and protect our nation, as enumerated in our national anthem “Firm may we stand to defend”. As members will recall, our country has sought to obtain a new constitution for the last two decades without success. But now we seem very close to this goal. During the just ended recess, the Parliamentary Select Committee on the Constitution did this House and the Nation proud, following their consensus after two weeks of deliberations in Naivasha. On behalf of all Kenyans and this House, I take this opportunity to commend the Select Committee for a job well done. I also welcome the progress made by the Committee of Experts on the Constitution. We are looking forward to the presentation of a consensus draft constitution to this august house by the Parliamentary Select Committee in the next few days. This Tenth Parliament has a historic opportunity to rise to the occasion by passing a new Constitution for the Republic of Kenya. We must be successful in this endeavour at this defining moment in our nation’s history. I, therefore, urge Honourable Members to uphold the spirit shown by the P.S.C. in Naivasha. It is upon this House to maintain a national consensus on the new Constitution, and thus ensure that the people of Kenya will stand united during the referendum to be held later this year. The national concern over corruption has been on top of national debate for many years now. We have put in place institutions and enacted laws aimed at eradicating corruption in our country. Corruption undermines government policies and distorts allocation of public resources. It gives our country a poor image and discourages investments. We, as the grand coalition government have resolved to deal with the matter decisively. I am calling on the august house to work with the government in this endeavour. In order to win this war we must apply the law in a manner that is impartial and just. We must also not politicize or personalize the fight against corruption. In the last few months we have intensified the war against corruption. This momentum will be accelerated to cover all vulnerable sectors of government. In this regard all anti-corruption agencies should fast-track and conclude pending corruption cases. All inter corruption agencies have also been directed to enhance preventive measures. Secondly we will enhance the investigative and prosecution capacity of the respective agencies. Thirdly, the judiciary should also speed up the court process because speedy conclusion of corruption related cases is a key pillar in this fight. The government will provide adequate resources to improve the capacity of these institutions to speed up the processes. The public service has been directed to apply the law and regulations firmly and impartially. The government is also consulting with the judiciary into ways of placing a time frame on the period within which a corruption related case should be concluded. I now turn to the matter of national cohesion. Honourable Members will be aware that nearly two years after signing the National Accord, we have made substantial progress in managing our diversity as a country. We now have a National Cohesion and Integration Commission, and a new law that prescribes tough penalties for those promoting hate speech and ethnic tendencies. I call on Honourable Members to make national cohesion a main agenda for this Fourth Session, and the remaining two sessions of the Tenth Parliament. I encourage all Members of this august House to lead by example. All Kenyans are looking upon us to champion a uniting agenda. They are looking upon us to leading them as a united and patriotic people of this country. Kenyans should trust the leadership of the country and abandon the temptation to look externally for solutions that can easily be found locally. Kenya belongs to all of us. We should be a caring and working nation. In that regard we should spend more of our time discussing ideas and programs that create jobs and opportunities for our youth. These Ideas should uplift the standards of living of our people. We need to squarely confront poverty, which is so prevalent among our people. The best thing we can do is to invest in the education of our children and unleash the potential and productive capacities of our people. Let us have mixed delegations of Members of this House reaching out to the people with one message of unity of all Kenyans. Although we come from diverse origins, we are one people. We are one family! Let us strive to ensure every Kenyan is treated with respect and has the opportunity to live a dignified life, wherever they choose to settle. Never, shall we fight one another again. Turning to the economy, Honourable members will appreciate that economic growth and shared prosperity will go a long way in creating the much needed opportunities for our people. It will be recalled that in 2007 we recorded a G.D.P. growth rate of 7.1 per cent. This was the highest growth rate in three decades. In 2008, due to unfortunate events in our country as well as on the global arena, the economy grew by only 1.7 per cent. Last year, the recovery in tourism, and in some other key sectors, mitigated effects of the severe drought that caused food, water and energy shortages. As a result, the economy grew at 2.5 per cent. This year we are optimistic that the forecasted 4.5 per cent growth rate will be achieved. However, to experience real growth and success in the war against poverty, we must get our act together on two fronts. First our politics must promote political stability and public confidence in the future of our country. Secondly we must take policy initiatives that will reduce and maintain low interest rates. This will enable Kenyans access affordable credit for investments in wealth creation and expansion of employment opportunities. In this regard I wish to thank the Kenyan people for heeding my call to engage in increased production. In particular I note that dairy farmers have tremendously increased milk production. I commend them for their hard work. I assure them of continued government support that began with the revival of K.C.C. The challenges we are facing now of excess milk calls for diversification of our dairy products and markets. The government is encouraging the industry to take up this challenge. At the same time we have instructed the Ministry of Special Programs and livestock and Co-operatives to incorporate powder milk into the national food security reserves. Before I outline this Session’s legislative and policy agenda, I wish to express my appreciation to the House for the bills passed in the Third Session of the Tenth Parliament. The laws addressed several policy concerns. For instance, the Proceeds of Crime and Anti-Money Laundering Act will go a long way in reducing the emergence of organized crime in our country. I thank Honourable Members for their contributions during the last session. During this session the government will be tabling a wide range of bills including those which will arise out of the new constitution. In the sector of law enforcement and administration of justice the government will be tabling a number of bills. The proposed laws are expected to improve police accountability and enhance the public image of the police as servants of the people. Public concerns have also been constantly raised on the need to improve efficiency and integrity of our judicial system. The Government will therefore re-introduce the Judicial Service Bill which will entrench the independence of the judiciary, and make it more effective in the administration of justice. This will also enable the judiciary to recruit judges and magistrates more efficiently. It will also lead to the required numbers to cope with the national case load. There should be no reason why at this point of our development, Kenya should not have enough judges and magistrates. Indeed, an efficient and effective judiciary will be the cornerstone of a revived economy as well as creating confidence in the justice system. One of the key elements in fighting crime is the effective protection of whistle blowers and witnesses. To this end, the Government will soon table amendments to the Witness Protection Act. The aim is to establish an autonomous Witness Protection Agency that is capable of effectively protecting any witnesses to corruption, organized crimes and international crimes from reprisals. It will also cover witnesses who have crucial information in regard to the post-election violence that rocked our country. In regard to reforms in our electoral system, we are all agreed on the urgent need to put in place a credible and efficient system. This is the best way of ensuring that the public have confidence in the final outcome of our elections. The Government will table before this House the Election Bill which will consolidate all election laws in Kenya. This will prevent malpractices in general elections as well as provide the procedures for conducting referendums. Similarly, the Government proposes to table the Local Government Bill, with the principal objective of repealing the current Local Government Act. The bill will provide for a legal framework that will enhance accountable and effective management at the local government level. It will provide for the direct election of mayors and deputy mayors of city and municipal councils. Direct elections will also be held for chairpersons and deputy chairpersons of country councils. The bill also provides for the re-organisation of local authorities and establishment of metropolitan councils. VISION TWENTY THIRTY seeks to transform Kenya into a competitive and prosperous middle income economy. In order to achieve this goal, we must change the way we carry out business in our country. We must provide an enabling legal environment to make Kenya more competitive for business and investment. The Government will, therefore, table several business-friendly bills in this Session. The current outdated Companies Act will be replaced by the proposed Companies Bill. The bill will seek to amend, and simplify the law relating to companies. The bill will be accompanied by the Partnership bill and the limited liability partnerships bill. The Government will also table the Insolvency Bill to replace the Bankruptcy Act, and streamline procedures in bankruptcy and insolvency law. The bill will also provide for the rehabilitation of the insolvent debtor, unlike the present situation where insolvency almost always results in liquidation. 5. Special Economic Zones Bill. The year TWENTY TEN will be a momentous year for our region. Last year, Kenya together with its partner states in the East African Community signed the Common Market Protocol that is set to take effect in July this year. As a result, there will be no duty charged on goods originating from within the community. Later this year, other elements of this Protocol such as the free movement of persons will also take effect. These developments are of enormous economic importance for our country. Given the sustained high economic growth rates enjoyed by the regional economies, we must place ourselves strategically to supply the region with much needed goods and services. In this regard, the Government has proposed several policies and projects, some of which will be tabled before this House. We shall be tabling the Special Economic Zones Bill and Sessional Paper, both of which will seek to transform Kenya into regional hub. I appeal to members of parliament to educate Kenyans on the opportunities that are being offered by the East African Community. We shall also be presenting to this house financing approvals for new infrastructure projects and other national investment projects including. 3. The new transport corridor in Northern Kenya which incorporates the Lamu Port - Southern Sudan-Ethiopia Transport and Development Corridor. All the business and economy related bills, policies and projects that I have mentioned are important. They are critical to reducing poverty, achieving equitable development throughout the country and creating numerous jobs and decent incomes for our youth. I, therefore, urge the House to give them priority in their discussions and passage during this session. As we commence the Fourth Session of the Tenth Parliament, I appeal to Honourable members to shun divisive partisan politics and focus on the greater good of our country. Whatever differences may arise between us should be amicably resolved in the national interest. In conclusion, may I note that in my nearly half a century as a legislator, there has not been a Session of Parliament with the potential to bring as much positive change to Kenya as this one. Honourable Members, I have confidence that this House is up to the task and that it will fulfill its national duty and secure a memorable place in history. It is, therefore, my pleasure to declare the Fourth Session of the Tenth Parliament officially opened.